As part of our efforts to promote European integration and federalism, we are proud to present the Jean Monnet Prize for European Integration. This prize, awarded annually, recognises and celebrates achievements that contribute to supporting and strengthening European integration. Its 2018 Edition is organised under the patronage of the European Commission Representation in France. For its work to create a greater space for information across traditionally separate parts of Europe and its contribution to the emergence of a genuine transnational public sphere, Political Critique is the first runner-up of the Jean Monnet Prize. Read more. For its concrete support to integration through the setting-up of a local, citizen-led European library foster dialogue and exchange, UE Lib’ is the second runner-up of the Jean Monnet Prize. Read more. For its advocacy in favour of a free Interrail voucher for every European turning 18, enhancing mobility and supporting first-hand discovery of Europe for all youths, #FreeInterrail is the winner to the 2018 Jean Monnet Prize for European Integration. Read more. The Jean Monnet Prize for European Integration aims at honouring Jean Monnet’s memory and life achievements. It does so by rewarding talented individuals or groups having contributed to supporting or strengthening European Integration through a project they designed and implemented. Jean Monnet was born in Cognac, France, on 9 November 1888. Through his family’s cognac business, he travelled extensively, including to the United Kingdom and the United States. He contributed to the war effort of both World Wars by aligning the war industries of Allied powers and, during World War II, worked tirelessly to prepare the US industry for the country’s direct involvement. Jean Monnet also served as Deputy Secretary General of the League of Nations during the inter-war period. After 1945, Monnet became an influential supporter of European unity, including through his Action Committee for the United States of Europe and led to the creation of the European Coal and Steel Community, the first European institution endowed with supranational powers, of which he became the first president. 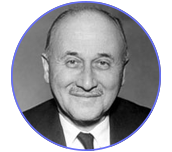 A strong supporter of European federalism, Jean Monnet has been called “The Father of Europe” and was instrumental in setting up what became the European Union. Read more about Jean Monnet in his own words at the Jean Monnet Foundation. 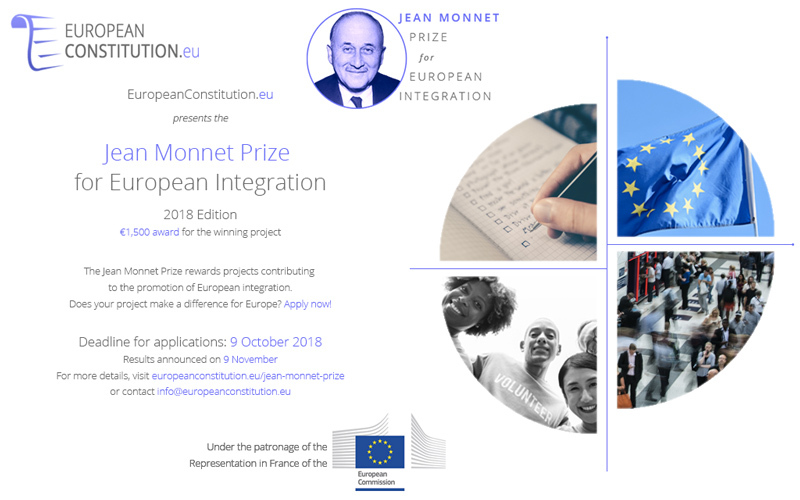 The Jean Monnet Prize for European Integration rewards implemented projects (or projects under implementation) that contribute to promoting or strengthening European integration. What is a project contributing to European integration? We, at EuropeanConstitution.eu, have a broad view of European integration and believe it is as much about the people than about institutions. Many cross-border projects can therefore be considered to contribute to European integration or promote the European spirit. You create or facilitate exchange programmes within the EU? Apply! You contribute to language learning or cultural encounters? Apply! Your project promotes the discovery of European history or shared knowledge about our heritage? Apply! We believe that people’s imagination and creativity are endless; this is why we are opening wide the range of projects we can support. If your project relates to the EU, we want to hear about it! Short and relevant annexes can be added to the application document. Deadline for application to the 2018 edition: 9 October. Results will be announced on: 9 November, anniversary of Jean Monnet’s birth. By applying, candidates accept the statute of the contest; for more details about the application document and process, consult the statute here.